My Marti has a "Q". As does mine, just not in the vehicle order image. Ah, I need to check that line . The Ford VIN is 7R02A158062. The VIN is in plain sight right near the top left right under "Vehicle Order Image". BTW, the "A" supposed to be a "K"
Don't think this is anything new or exciting. All 67 350 are listed as A, All 67 500 are listed as S in the Marti vehicle order images of the few dozens of Marti reports I have seen. Well, I just assumed that the 67 350 289's were "K" code cars like the 65-66. The A code is a anomaly and is rare. There are a few GT500's with a K engine code anomaly's also. For $195,000 you would think it would have original valve covers on it. When I see those obvious problems, I always wonder what else is incorrect and not pictured. It sure does look great in that color. "is currently registered in California with a California black plate and a 1967 sticker. " ----Does CA have a YOM plate program ? Since it went to FL it would not have a CA plate. We (the forum before the crash) had a fair lengthy discussion about this car as has been mentioned a little over 10 years ago. Remember the color discussion or should I way the explanation used by the last owner (before the current one I believe) of why they choose the color they did. Reviewed some pictures of the car a few weeks back and that is what made me recall the car and the thread. Thought the car was still in Fresno at the time of the other thread. Same pictures are being reused again as sometimes happens with sales. Over the years many owners have added Calif plates to their cars. Often then get the lettering sequences wrong which makes it stand out or make some other choice that brings it into question. In recent years Calif has allowed owners, for an additional cost, to put black and gold plates on a car. I was aware you could put a new black plate on but do they allow an original black plate to go on ? As I understand there are ways to "return" black plates to a car. This original SVO sheet for DSO 84-2572 was just emailed to me from a friend in CA. He found it on the Fast Lane website. 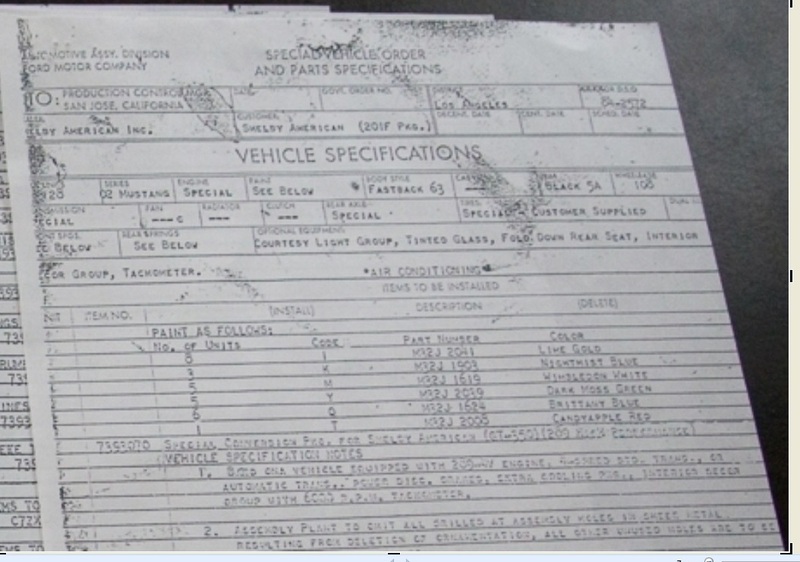 Notice there is no hand written gray car, but rather the correct typed in Candyapple Red car listed 1 unit. There is also no hand written text "211F" in the upper area, instead the correct "201F" package is typed in for this DSO. Yikes...please no. I don’t know who they consigned, but they are offering to make it an Eleanor if that helps sell it. Bolt in upgrades fine, but I hope no one takes their Eleanor offer. I doubt someone would build an Eleanor using a $195k starting point. Or at least I hope not.